She imported the book manuscript into MAXQDA. In this case, the book was imported chapter by chapter from a Word document. If you have a PDF file with finalized page numbers (e.g. if your publisher has already sent a PDF file with final page numbers), import that one. INDEXING MANUALLY: While reading through the manuscript, codes were used to tag parts of the text: A section that deals with cultural property was coded "cultural property". First, create a code "British Museum" in the list of codes. If the code already exists, left-click on the code "British Museum" in the code system window on the bottom left. This is necessary because MAXQDA lets you only auto code with the last few codes you've worked with/clicked on. Now open the lexical search window (click on the looking glass icon on in the icon bar). Now type in the search key, and click on "run search". MAXQDA will now display a list of search results. Click on the autocode symbol in the search results window (a green coding strip). Now, a smaller window will show up (see screenshot below). Make sure you have selected the correct code in the drop down list in this autocode window. If your code does not show up, you'll unfortunately have to close the autocode window (you don't have to close the search results window), then left-click on the desired code in the list of codes, and click on the auto-code symbol in the search results window again. 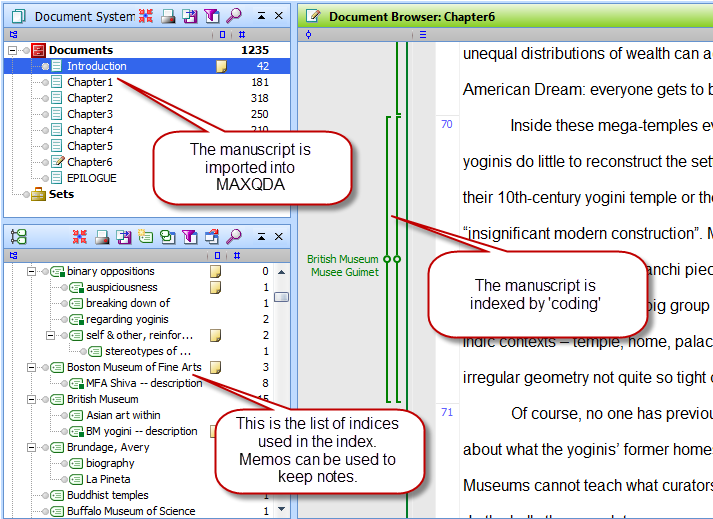 Before you execute auto coding, select "paragraph" in the auto code window - MAXQDA will now automatically code every paragraph mentioning the British Museum as "British Museum". The great thing about indexing with codes is that you can later merge and rename codes/indices very easily. After Jesse read through the book indexing manually, and after automatically coding names and places, she exported the coding tree as an Excel file (by clicking on the purple floppy disc symbol on top of the list of codes). This file she sent to the author, who annotated the file, telling her which codes to merge, and which to leave out. Of course, this step can be directly executed in MAXQDA as well. A few weeks later, the publisher sent a PDF which included the final page numbers. Now, Jesse opened the PDF in the Adobe Acrobat Reader, and opened the MAXQDA project file she's used to index the manuscript. She activated all of the documents in the document system and the code/index she wanted to work on. In the retrieved segments window (bottom right), she found the segments she had indexed with the code. By clicking on the yellow post-it on the left, the program showed her where in the document this snippet was located. Now she simply had to scroll through the PDF to find this section, and she write down the page numbers. If you work with a document with finalized page numbers in the first place, this last step is even easier: You'll just have to search for the code/index you are working on, then click through the instances in the retrieved segments window, and write down the respective page numbers that you can see in the MAXQDA document browser. Special thanks go to Padma Kaimal of Colgate University - the screenshots show parts of her new book: Scattered Goddesses: Travels with the Yoginis.